In the May 25, 2018 issue of the journal, Science, UA Physics Department scientists Warren Beck and Li Cheng, and former student Lara White, authored an article discussing their work on orbital forcing of Asian monsoon dynamics. They and their Chinese colleagues in Xi'an China developed a new paleoclimate proxy which they use to reconstruct Asian monsoon rainfall variations over the last 550,000 years. Their work shows how changes in the shape of the Earth's orbit have influenced Asian monsoon dynamics via modulation of the interhemispheric solar insolation gradient. Their rainfall proxy links local atmospheric flux of the cosmogenic isotope 10Be to rainfall amount. Using the UA Physics Department accelerator mass spectrometer, they measured 10Be from a Chinese Loess Aeolian sediment sequence, to produce their record of East Asian summer monsoon intensity. Their work reveals that the low latitude interhemispheric solar insolation gradient likely controls Asian monsoon strength by modulating the pattern of upper tropospheric outflow from the Asian monsoons to the North Pacific vs. Southern Indian Ocean subtropical highs. In so doing it also regulates the relative strength of Hadley and Walker circulations in the Indo-Pacific sectors. This in turn influences the relative strength of the Indian and Western North Pacific summer monsoons by influencing Trade Wind velocity in these two sectors through angular momentum export. Nearly 100 years ago, Serbian Scientist, Milutin Milankovitch proposed that gravitational influences from other planets (mainly Jupiter) produced cyclic perturbations in the shape of the Earth's orbit which could affect climate by changing the distribution of solar heating (insolation) as a function of latitude. He theorized that cyclic solar insolation changes above 65°N latitude were the dominant causal agent of glacial-interglacial climate cycles spanning the last several million years. More than 30 such major cycles have occurred during the Pleistocene (2.56 Ma to present). His theories have become doctrine in climate science, but Dr. Beck and his colleagues now suggest that it may instead be the low latitude interhemispheric insolation gradient--not high northern latitude insolation-- which force these planetary scale oscillations in climate. They propose that dynamical variations of the tropical monsoons are actually the agent through which these major climate cycles are mainly mediated. Link to article: A 550 Ka record of East Asian monsoon rainfall from 10Be in loess. J. Warren Beck, Zhou Weijian, Li Cheng, Zhenkun Wu, Lara White, Feng Xian, Xianghui Kong, and Zhisheng An. Science, May 25, 2018. Vol. 360, Issue 6391. 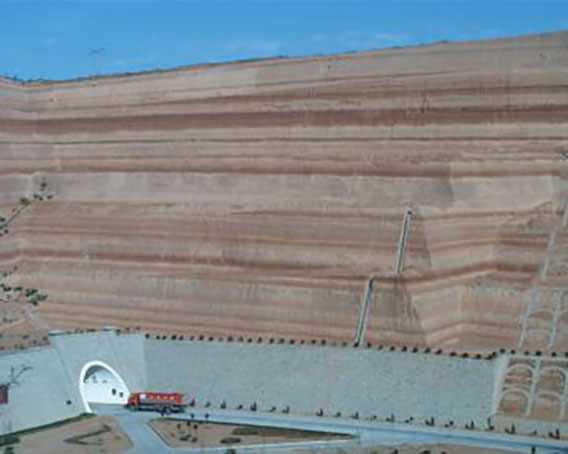 Image shows a classic loess-paleosol sediment sequence of the Chinese Loess Plateau. The darker and lighter layers represent buried paleo-soils and Aeolian loess, each representing wetter and dryer epochs of past climate respectively. This particular site shows the last 1.34 Ma of sediment record.